RICHMOND, VA. (October 26, 2016) – Kaléo, a privately-held pharmaceutical company, today announced that it will reintroduce AUVI-Q® (epinephrine injection, USP) auto-injector to the U.S. market in the first half of 2017. AUVI-Q is a prescription medicine used to treat life-threatening allergic reactions, including anaphylaxis, in people who are at risk for or have a history of serious allergic reactions. AUVI-Q is a compact epinephrine auto-injector with industry-first features, including a voice prompt system that guides a user with step-by-step instructions through the delivery process, and a needle that automatically retracts following administration. AUVI-Q is engineered to help patients and their caregivers to confidently administer epinephrine in life-threatening allergic emergencies. After regaining the rights to AUVI-Q, kaléo conducted a thorough manufacturing assessment and invested in new technology and quality systems to ensure accurate, reliable and consistent delivery from the product. AUVI-Q is manufactured on an intelligent, high-tech, 100% automated robotic production line with more than 100 automated quality checks on each AUVI-Q, ensuring a streamlined and consistent production process. Kaléo is aware of the epinephrine auto-injector access and affordability challenges confronting patients and is working to engage with various stakeholders, including wholesalers, insurance companies, pharmacies and pharmacy benefit managers, to ensure that all patients regardless of insurance coverage, have affordable access to AUVI-Q. “We are very excited about patients once again having a choice in epinephrine auto-injectors,” said Eleanor Garrow-Holding, President and CEO of the Food Allergy & Anaphylaxis Connection Team (FAACT). “As food allergy advocates and families personally affected by food allergies, we understand that each person with food allergies has individual needs and comfort levels. Those living with life-threatening allergies deserve innovative products and choices that meet their individual needs. As such, we are grateful that patients will have options when selecting their potentially life-saving epinephrine auto-injector." The latest updates regarding the return of AUVI-Q will be available to members of the public who register online at www.auvi-q.com. Anaphylaxis (pronounced ana-fuh-lak-sis) is a serious allergic reaction that happens quickly and may cause death. Anaphylaxis can occur as a result of exposure to PP-AQ-US-0045 allergens including tree nuts, peanuts, milk, eggs, fish, shellfish, soy, wheat, insect bites, latex and medication, among other allergens. 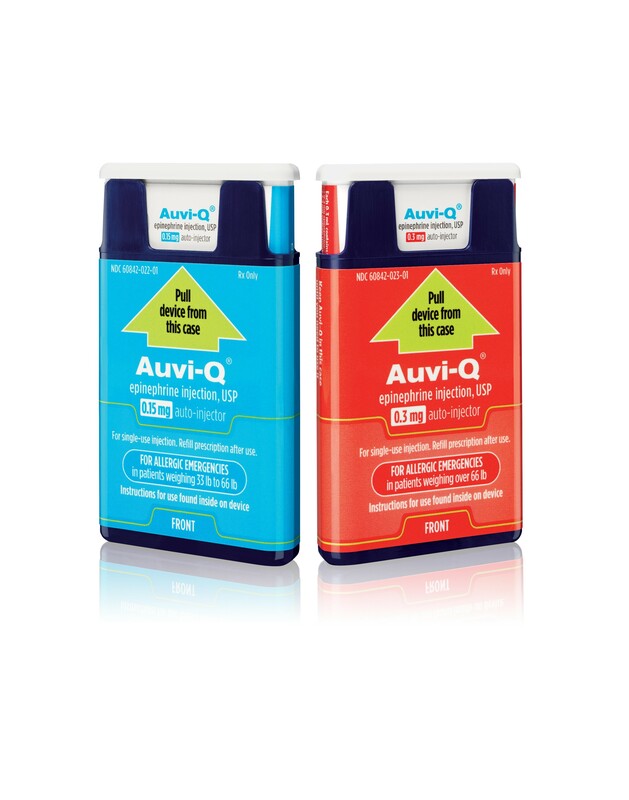 AUVI-Q® (epinephrine injection, USP) Auto-injector is a prescription medicine used to treat life-threatening allergic reactions, including anaphylaxis, in people who are at risk for or who have a history of serious allergic reactions. AUVI-Q contains epinephrine, a well-established, first-line treatment for severe, life-threatening allergic reactions that occur as a result of exposure to allergens including food such as peanuts, tree nuts, fish, shellfish, dairy, eggs, soy and wheat; insect stings or bites; latex and medication, among other allergens and causes. Invented by twin brothers Eric and Evan Edwards, a physician and engineer who each suffer from life-threatening allergies, AUVI-Q is a compact epinephrine auto-injector with industry-first features, including a voice prompt system that guides a user with step-by-step instructions through the epinephrine delivery process, and a needle that automatically retracts following administration. In emergencies such as anaphylaxis, it is often individuals without medical training who need to step in and deliver potentially life-saving rescue therapy. AUVI-Q was designed – through careful analysis of the situations where epinephrine is used and with significant input from the allergy community that relies on it – to reflect Human Factors Engineering (HFE). HFE is about designing products or systems that are easy to operate and, most importantly, support correct use, with the goal to remove the potential for error. Kaléo is a pharmaceutical company dedicated to building innovative solutions for serious and life-threatening medical conditions. Our mission is to provide innovative solutions that empower patients to confidently take control of their medical conditions. We believe patients and caregivers are the experts on how their medical condition impacts their lives, and are an integral part of our product development process. Each kaléo product combines an established drug with an innovative delivery platform with the goal of achieving superiority and cost effectiveness. Kaléo is a privately-held company headquartered in Richmond, Virginia. For more information, visit www.kaleopharma.com.